A play is a form of literature written by a playwright, usually consisting of dialogue or singing between characters, intended for theatrical performance rather than just reading. 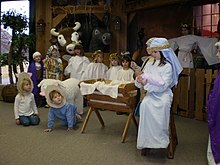 Plays are performed at a variety of levels, from Broadway, Off-Broadway, regional theater, to Community theatre, as well as university or school productions. There are rare dramatists, notably George Bernard Shaw, who have had little preference as to whether their plays were performed or read. The term "play" can refer to both the written texts of playwrights and to their complete theatrical performance. Comedies are plays which are designed to be humorous. Comedies are often filled with witty remarks, unusual characters, and strange circumstances. Certain comedies are geared toward different age groups. Comedies were one of the two original play types of Ancient Greece, along with tragedies. An example of a comedy would be William Shakespeare's play A Midsummer Night's Dream, or for a more modern example the skits from Saturday Night Live. A generally nonsensical genre of play, farces are often acted and often involve humor. An example of a farce includes William Shakespeare's play The Comedy of Errors, or Mark Twain's play Is He Dead?. A satire play takes a comic look at current events people while at the same time attempting to make a political or social statement, for example pointing out corruption. An example of a satire would be Nikolai Gogol's The Government Inspector and Aristophanes' Lysistrata. 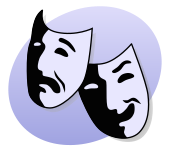 Satire plays are generally one of the most popular forms of comedy, and often considered to be their own genre entirely. Restoration comedy is a genre that explored relationships between men and women, and was considered risqué in its time. Characters featured in restoration comedy included stereotypes of all kinds, and these same stereotypes were found in most plays of this genre, so much so that most plays were very similar in message and content. However, since restoration comedy dealt with unspoken aspects of relationships, it created a type of connection between audience and performance that was more informal and private. It is commonly agreed that restoration comedy has origins in Molière’s theories of comedy, but differs in intention and tone. The inconsistency between restoration comedy’s morals and the morals of the era is something that often arises during the study of this genre. This may give clues as to why, despite its original success, restoration comedy did not last long in the seventeenth century. However, in recent years, it has become a topic of interest for theatre theorists, who have been looking into theatre styles that have their own conventions of performance. These plays contain darker to their downfall. Tragic plays convey all emotions and have very dramatic conflicts. Tragedy was one of the two original play types of Ancient Greece. Some examples of tragedies include William Shakespeare's Hamlet, and also John Webster's play The Duchess of Malfi. These plays focus on actual historical events. They can be tragedies or comedies, but are often neither of these. History as a separate genre was popularized by William Shakespeare. Examples of historical plays include Friedrich Schiller's Demetrius and William Shakespeare's King John. Artaud did not believe that conventional theatre of the time would allow the audience to have a cathartic experience and help heal the wounds of World War II. For this reason, he moved towards radio-based theatre, in which the audience could use their imagination to connect the words they were hearing to their body. This made his work much more personal and individualized, which he believed would increase the effectiveness of portraying suffering. Famous playwrights within this genre include Beckett, Sartre, Ionesco, Adamov, and Genet. Next to the text to be spoken by the actors, a script contains "stage directions" (not to be confused with the use of that term in blocking, the staging of actors with specified movements across the stage). The most common type is for the entering and exiting of actors, e.g. "[Exeunt Caliban, Stephano, and Trinculo.]" (Exeunt is the Latin plural of exit, meaning "[they] leave".) Other stage directions may indicate the manner of delivery of the text, like "[Aside]" or "[Sings]", or indicate sounds to be produced off-stage, like "[Thunder]". ^ a b "THE ANCIENT GREEK DRAMA & THEATRE HISTORY PAGE". anarchon.tripod.com. Retrieved 2008-06-16. ^ "Origin of Comedy". www.theatrehistory.com. Retrieved 2008-06-16. ^ Vernon, P.F. (1962). "Marriage of Convenience and the Moral Code of Restoration Comedy". Essays of Criticism: 370–387. ^ The Ornament of Action. Cambridge University Press. 1979. ^ Styan, J.L. (1986). Restoration Comedy in Performance. Cambridge University Press. ^ The Three Richards: Richard I ... - Google Book Search. books.google.co.uk. 2006. ISBN 978-1-85285-521-5. Retrieved 2008-06-17. ^ Bordman, Gerald (1978). American Musical Theatre (3 ed.). New York, NY: Oxford University Press. ^ Finter, Helga; Griffin, Matthew (1997). Antonin Artaud and the Impossible Theatre: The Legacy of the Theatre of Cruelty. MIT Press. pp. 15–40. ^ Esslin, Martin (2001). Theatre of the Absurd. ISBN 1-4000-7523-8.